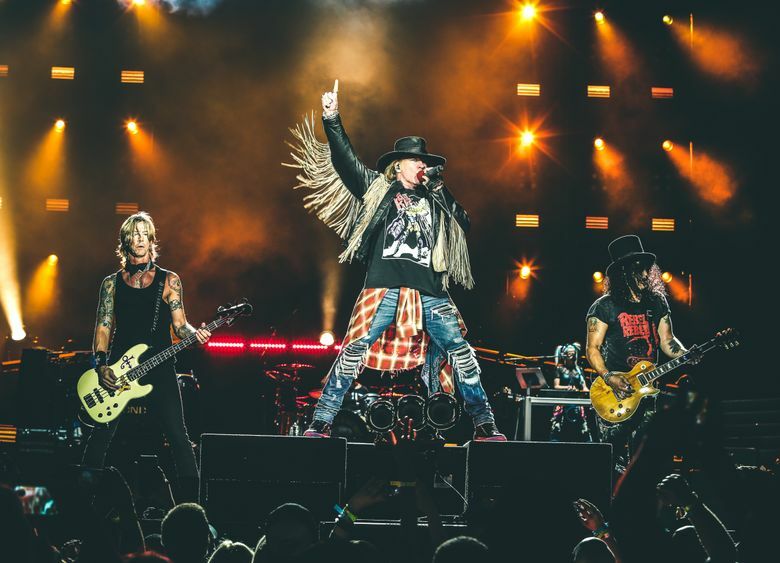 After years of fighting and feuding, Axl Rose, Slash and Duff McKagan are finally back out on the road with hard-rock megastars Guns N’ Roses. The band performs at CenturyLink Field on Friday, Aug. 12. But success wasn’t far away. Two years after that gig, the band released “Appetite for Destruction,” which sold more than 30 million copies and spun off such trademark songs as the blistering “Welcome to the Jungle” and “Sweet Child O’ Mine,” an unlikely love song from rock’s newest bad boys. Now, the band is bringing its “Not in This Lifetime” tour back to Seattle on Friday, Aug. 12, playing a venue across the street from where Gorilla Gardens once stood — CenturyLink Field. The show has been given some Northwest luster with the addition of Alice in Chains and McKagan’s daughter Grace’s band, The Pink Slips, as opening acts. The concert is expected to draw a capacity crowd of 40,000. As the tour name suggests, it’s an unlikely (partial) reunion gambit for one of rock’s most tempestuous bands. 7:30 p.m. Friday, Aug. 12, at CenturyLink Field, 800 Occidental Ave. S. Seattle; $45-$250 (800-745-3000 or ticketmaster.com). But excessive substance abuse took its toll. Drummer Steven Adler was fired in 1990 and guitarist Izzy Stradlin quit the band the following year, though by then he was clean and sober. After 1993, the band stopped performing live. Sessions for a new album stalled. In frustration, guitarist Slash left in 1996, followed by McKagan in 1997. Lead singer Axl Rose, the sole remaining original member, insisted the group was still a going concern, despite a 15-year gap between the 1993 album “The Spaghetti Incident?” and 2008’s “Chinese Democracy,” which received a mixed reception. Members constantly came and went. Adler sued for lost royalties. Slash and McKagan sued Rose over songwriting credits. Slash, McKagan and Rose sued their label for releasing a greatest-hits album. A Rose-led Guns N’ Roses played sporadically from 2001 on. Bad feelings lingered. In 2009, Rose stated he’d never play with Slash again. When the band was inducted into the Rock & Roll Hall of Fame in 2012, neither Rose nor Stradlin attended the ceremony. But relations gradually thawed, and in January 2016 it was announced that Slash and McKagan were returning to the fold (neither Stradlin nor Adler is in the current lineup, which includes four other musicians). The tour’s been getting good notices; “Rolling Stone” called it “the triumphant return of one of the most important bands to cross rock music history.” Against all odds, the onetime bad boys are still alive and kicking. Gillian G. Gaar: gaarski@hotmail.com; on Twitter: @GillianGaar. Gillian G. Gaar has written about music, entertainment, and all things pop culture for local and national publications. She is the author of more than 10 books (on Nirvana, Elvis, Green Day and The Beatles, among others), including "She's A Rebel: The History of Women in Rock & Roll."